Today, 21 September 2016, is National Oral Health Day in South Africa! According to the South African Government: ‘two of the world's most common health problems affect the mouth – cavities (dental caries) and gum disease. Gum disease ranks second only to the common cold in terms of prevalence, with an estimated 90% of South Africans experiencing the problem at some point.’ It is therefore vital to pay extra attention to one’s dental routine and to practice good oral hygiene! Dentist’s recommend we brush our teeth twice a day and floss at least once a day to help prevent gum disease and cavities. Since the beginning of the month, I have started to incorporate the use of Sunstar GUM Soft-Picks Advanced (especially after a meal), as part of my daily oral care routine. The product helps to remove food particles and plaque between the teeth, whilst giving one’s gums a gentle micro-massage. Sunstar GUM Soft-Picks Advanced is comfortable and easy to use. 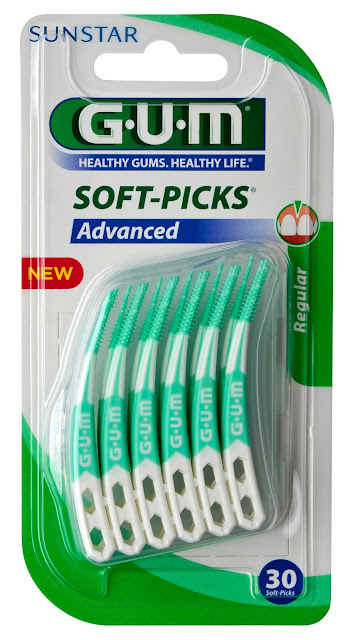 The tapered synthetic rubber bristles are soft and feel gentle on my gums. Also, the bristles seem to slip effortlessly between my teeth. Sunstar GUM Soft-Picks Advanced is easier and less annoying then toothpicks, It is available at Dis-Chem and leading pharmacies.